Flexible and easily tailored to your law firm's needs. We've found Lexreception to answer the phone on time in a professional manner, and they can tie into our calendar system to schedule appointments. Better yet, they help the entrepreneurial attorneys ensure that they never miss a call and can handle the volume of a high performing lead generation campaign. We've have a great experience with Lex. I was looking for an answering service. We went through a few, and ended up settling on Lex. I will tell you that the client feedback that we received as a result of that has been unanimously positive. It's been fantastic. We've received many compliments since switching to Lex for our receptionist needs - highly professional, friendly, and courteous!. With Lex we're getting those people's phone calls. And because they have a script, those people don't realize they're not talking to someone in our office, and they're setting appointments. Lex took at least two phone calls and made two appointments on their first weekend. Those people came in, retained us, and just like that made us somewhere between $4,000 to $5,000 just by making those appointments. If we waited until Monday morning, those people would have spoken to somebody else or gone someplace else. They sold me after that. Lexreception has greatly increased the quality of our client service and has helped bring in 1 to 2 new clients a month, all for a small monthly investment. Voice mail is obsolete. 24/7 live, personable reception is THE way to guarantee never missing the next big case. 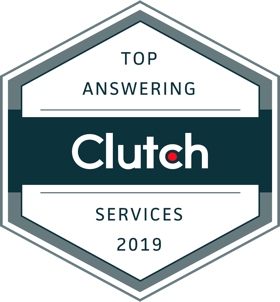 Voted the best answering service brand for the year 2019 by Clutch. Calls under 30 secs are completely FREE! Get a feel for how we will answer your calls. Make a call and connect with one of our receptionists. Additionally, a member of our team will be reaching out to you to gather a little bit more information about your company for our receptionists. We're looking forward to taking your calls.